In the 1870s, San Francisco was the center of advanced photography in the United States. 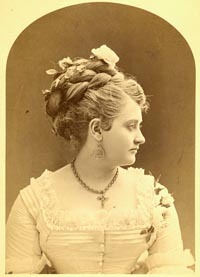 The most renowned portrait photographers in San Francisco were the studio of Bradley& Rulofson. Every visiting celebrity, statesman -- Kings, Presidents, Theatre Stars – had their portrait taken by B&R. Around 1872 B&R took a series of portraits of a beautiful woman which they considered to be their most artistic work ever. They sent six prints to "The Philadelphia Photographer," the most important U.S. periodical on the subject, which published them and awarded their 1874 “Gold Medal” to B&R for them. Although she was not named in the article, the model in the portraits was Flora Muybridge, wife of B&R photographer Eadweard Muybridge. It’s unlikely he took the photos, as he was a landscape photographer and not known to be particularly adept with portraits. The photos would have been taken shortly after their marriage (is she wearing her wedding dress?) and only 2-3 years before her death. Flora was at the center of a murder trial after her husband discovered she had been unfaithful, and killed her lover, Major Harry Larkyns. This portrait of Flora represents an important piece of history, and is certainly one of the most important photographic portraits of the 1870s. It was made with great care, using the finest techniques, paper, and chemicals. Like most prints of its time, before the widespread use of enlargers, it is a contact print the exact size and dimensions of those that were sent to Philadelphia. An exquisite patina has developed in the albumen over the past 130 years – it is truly a gold medal picture.